To encourage literature and the arts is a duty which every good citizen owes to his [or her] country. Howdy and thanks for joining us for this session of write right. My name is Bailie, and today we are going to discuss the rules of capitalization. 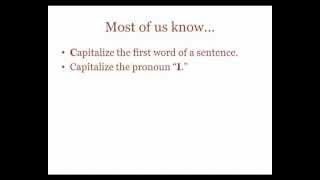 Most of us know to capitalize the first word of a sentence and the pronoun “I,” but some of the less obvious rules can be tricky. In this episode we are going to discuss basic rules of capitalization and clarify some rules that are commonly confused. So let’s get started! First of all, we always capitalize proper nouns. A proper noun names a particular person, place, thing, or group. These not only include specific people’s names such as Albert Einstien and place names such as College Station, Texas, but also institution names such as Texas A&M University, organization names like the Red Cross, and brands such as Microsoft. Next, we must always capitalize days of the week and months. As you can see in the sentence “we always leave on our family vacation on the last Friday in June.” The “F” in Friday and the “J” in June are both capitalized. Countries and Cities are always capitalized, as well as words that are associated with them. For instance, Italy and Italian, Rome and Roman. Directions are another commonly confused rule. Take a look at this sentence: “The birds fly to the Northwest every winter.” In this instance we capitalize “Northwest” because we are referring to a specific region. On the other hand, in the sentence “Bob’s farm is three miles east of Austin,” we do not capitalize “east” because it is being used as a compass direction and not a specific region. Next is holidays such as Easter and historical eras such as the Middle Ages, and we always capitalize these! Have you ever wondered why only certain words are capitalized in titles? This is because we only capitalize the first word and significant words after it. A significant word is any word that is not an article, preposition, or coordinating conjunction. Let’s look at the book title “A Tale of Two Cities.” “A” is capitalized because it is the first word of the title. “Tale,” “Two,” and “Cities” are capitalized because they are significant words, and the word “of” is not capitalized because it is a preposition. Only a few more rules left! When addressing people of title, we capitalize the titles that are used with a proper noun, but not those that are used without one. In the sentence “I had lunch with President Obama last week,” We capitalize the word “president” because it precedes the name “Obama.”. In the sentence “My sister is the president of her school’s drama club,” we do not capitalize the word “president” because it is not used with a proper noun. And last but not least, acronyms are always capitalized. Here are a few examples: The capitalized letters “NATO” stand for North Atlantic Treaty Organization and “UN” stands for United Nations. Well that about sums up this episode on capitalization. I hope these reminders were helpful! Thanks again for listening to write right, we’ll see you next time!